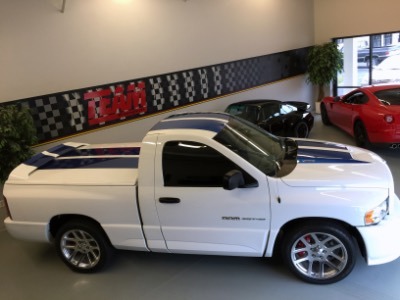 2005 Dodge Ram SRT-10 - #171/200 Commemorative Edition - White with Blue Stripes (exclusive to the Commemorative Edition) - 8.3L 500hp Viper V-10 Engine with 6 Speed Manual Transmission. Also, equipped from the factory with: Polished Wheels, Hard Shell Tonneau Cover, SRT Bed Liner. Clean AutoCheck. Looks, drives, and feels like a brand new truck. Don't miss out! We Never Charge Dealer Fees.